Hi everyone. My name is Bren Haddock, and I’m blogging here today for my author, Valerie Comer. I have mixed feelings about my author, truth be told. I guess she felt a bit sorry for me after introducing me as a secondary character in More Than a Tiara, a Christmas story about my friend Marisa Hiller. If, you know, I can call a woman who’s been both a professional model and a pageant winner my friend. Still kinda amazes me. You see, a few years ago, Marisa quit her modeling job and came back to her mom’s farm near Helena, Montana. They joined a CSA — that’s community supported agriculture, where folks can get a box of organic food delivered to their house every week — as growers. But Marisa has always cared about people less fortunate. Like me. Marisa invited half a dozen single moms to garden with her. Me an’ my kids, Davy and Lila, were among the lucky ones. Not only did she teach us how to grow food, but how to prepare it. How to freeze and can it. I hafta say, she changed my life. And then she introduced me to Jesus. For the first time in my life, I knew what real love was. It was so amazing, I can’t even begin to tell you. Through some unforeseen circumstances, which you can read about in More Than a Tiara, I was invited to manage Hiller Farm for the CSA. I tell ya, I’ve been studyin’ and workin’ my brain and fingers to the bone, learning all this new stuff. We moved out to the farm, which was great for my kids, since they didn’t have to share a bedroom anymore like they did in the dinky apartment. I didn’t think life could get any better for a gal with a tarnished halo. My author (and God, I s’pose) thought differently. But it didn’t start out so great. Not when Marisa and her bulldozy sister-in-law, Kristen, decided I should enter Lila in a pageant for kids. Hello!!! That is not my world. Want to know how the whole thing started? Here you go. If you think Kristen listened to me, you’d be wrong. Not only that, but then she tried to set me up with her husband’s new hire at his advertising agency. Rob Santoro. Some of you may have heard of the Santoro family from the Urban Farm Fresh Romance series. The Santoros live in the Spokane neighborhood of Bridgeview. Let’s just say Rob is way out of my league and leave it at that, shall we? If you want to read all about it, pick up Other Than a Halo on Kindle, Kobo, Nook, and iBooks. Here’s what my author says about this story — still seems weird to be referred to in third person, you know? 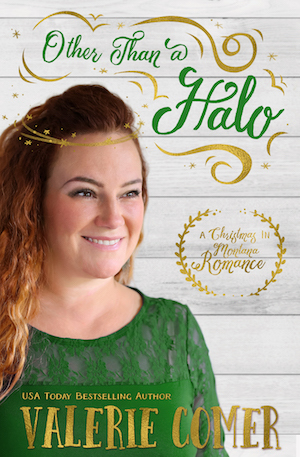 Want a chance to win an e-book copy of Other Than a Halo? Comment below before Saturday, November 12, and we’ll pick two winners and let you know Sunday, November 13. Fun post, Val! After the election, we need a little fun. It sounds like a great story as it offers hope and healing for those who struggle. Should be a fun read. I read Other Than A Halo and loved it!! Thanks for great stories! This is such a fun post for a fun book! This post was so fun. It was great to meet Bren. Now I’m really interested in the story. Thanks, Marylin! Bren was a lot of fun to write. Always love the chance to win books especially this time of year when I have no spare cash for books! Excited to read Bren’s story! I always enjoy your farm fresh twist, Valerie! Happy Tuesday! So much fun and thank you for the chance to win. This book sounds like a very good one. I like when folks overcome problems and have a good life. I hope you enjoy it, Brenda! Do you know, I never decided if Bren was short for Brenda? Or even short for anything, for that matter! She was just Bren from the moment we met. Thanks Bren for the intro/blog post. Sounds like it will be an interesting read. I really like the way you wrote this post. I had to read the first sentence twice to understand you’re writing as your character and not inviting another writer, but it was fun. Loved the blog post. If I win gift it to someone else. I have already read this beautiful book. It was fun to get to know Bren a little from this post, I love character interviews! I hope you enjoy the story, Trixi! 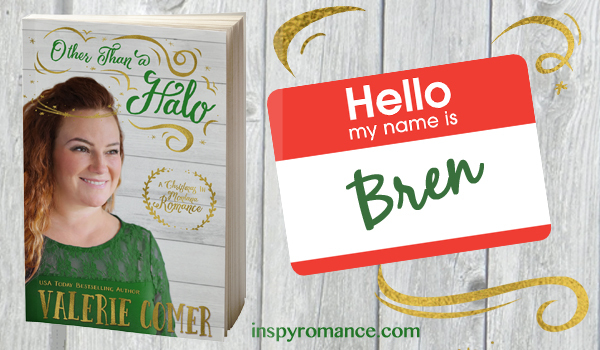 A great interview Bren :) Definitely putting your book on my TBR list! Thanks, Lientjie! I hope you enjoy it.